An autotroph or primary producer, is an organism that produces complex organic compounds (such as carbohydrates, fats, and proteins) from simple substances present in its surroundings, generally using energy from light (photosynthesis) or inorganic chemical reactions (chemosynthesis). They are the producers in a food chain, such as plants on land or algae in water (in contrast to heterotrophs as consumers of autotrophs). They do not need a living source of energy or organic carbon. 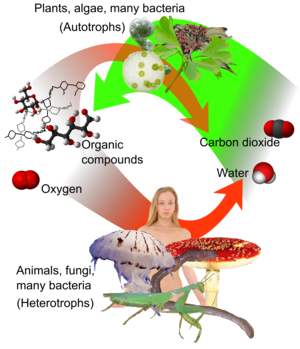 Autotrophs can reduce carbon dioxide to make organic compounds for biosynthesis and also create a store of chemical energy. Most autotrophs use water as the reducing agent, but some can use other hydrogen compounds such as hydrogen sulfide. Some autotrophs, such as green plants and algae, are phototrophs, meaning that they convert electromagnetic energy from sunlight into chemical energy in the form of reduced carbon. Autotrophs can be photoautotrophs or chemoautotrophs. Phototrophs use light as an energy source, while chemotrophs use electron donors as a source of energy, whether from organic or inorganic sources; however in the case of autotrophs, these electron donors come from inorganic chemical sources. Such chemotrophs are lithotrophs. Lithotrophs use inorganic compounds, such as hydrogen sulfide, elemental sulfur, ammonium and ferrous iron, as reducing agents for biosynthesis and chemical energy storage. Photoautotrophs and lithoautotrophs use a portion of the ATP produced during photosynthesis or the oxidation of inorganic compounds to reduce NADP+ to NADPH to form organic compounds. The Greek term autotroph was coined by the German botanist Albert Bernhard Frank in 1892. It stems from the ancient Greek word τροφή (trophḗ), meaning "nourishment" or "food". Some organisms rely on organic compounds as a source of carbon, but are able to use light or inorganic compounds as a source of energy. Such organisms are not defined as autotrophic, but rather as heterotrophic. 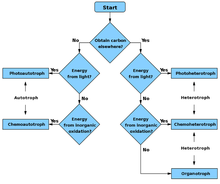 An organism that obtains carbon from organic compounds but obtains energy from light is called a photoheterotroph, while an organism that obtains carbon from organic compounds but obtains energy from the oxidation of inorganic compounds is termed a chemoheterotroph, chemolithoheterotroph, or lithoheterotroph. Evidence suggests that some fungi may also obtain energy from radiation. Such radiotrophic fungi were found growing inside a reactor of the Chernobyl nuclear power plant. Autotrophs are fundamental to the food chains of all ecosystems in the world. They take energy from the environment in the form of sunlight or inorganic chemicals and use it to create energy-rich molecules such as carbohydrates. This mechanism is called primary production. Other organisms, called heterotrophs, take in autotrophs as food to carry out functions necessary for their life. Thus, heterotrophs — all animals, almost all fungi, as well as most bacteria and protozoa — depend on autotrophs, or primary producers, for the energy and raw materials they need. Heterotrophs obtain energy by breaking down organic molecules (carbohydrates, fats, and proteins) obtained in food. Carnivorous organisms rely on autotrophs indirectly, as the nutrients obtained from their heterotroph prey come from autotrophs they have consumed. Most ecosystems are supported by the autotrophic primary production of plants that capture photons initially released by the sun. Plants can only use a fraction of this energy for photosynthesis, approximately 1% is used by autotrophs. The process of photosynthesis splits a water molecule (H2O), releasing oxygen (O2) into the atmosphere, and reducing carbon dioxide (CO2) to release the hydrogen atoms that fuel the metabolic process of primary production. Plants convert and store the energy of the photon into the chemical bonds of simple sugars during photosynthesis. These plant sugars are polymerized for storage as long-chain carbohydrates, including other sugars, starch, and cellulose; glucose is also used to make fats and proteins. When autotrophs are eaten by heterotrophs, i.e., consumers such as animals, the carbohydrates, fats, and proteins contained in them become energy sources for the heterotrophs. Proteins can be made using nitrates, sulfates, and phosphates in the soil. ^ Chang, Kenneth (12 September 2016). "Visions of Life on Mars in Earth's Depths". The New York Times. Retrieved 12 September 2016. ^ Mauseth, James D. (2008). Botany: An Introduction to Plant Biology (4 ed.). Jones & Bartlett Publishers. p. 252. ISBN 978-0-7637-5345-0. ^ Frank, A.B. Lehrbuch der Botanik. W. Engelmann, Leipzig 1892-93, . ^ Melville, Kate (23 May 2007). "Chernobyl Fungus Feeds On Radiation". Archived from the original on 4 February 2009. Retrieved 18 February 2009. ^ H., Schurr, Sam. Energy, economic growth, and the environment. New York. ISBN 9781617260209. OCLC 868970980. ^ Beckett, Brian S. (1981). Illustrated Human and Social Biology. Oxford University Press. p. 38. ISBN 978-0-19-914065-7. ^ Smith, Gilbert M. (2007). A Textbook of General Botany. READ BOOKS. p. 148. ISBN 978-1-4067-7315-6. Look up autotroph in Wiktionary, the free dictionary.